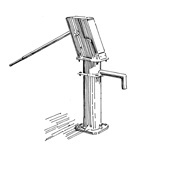 The main advantage of hand pumps is that they are one of the most economical and simple solutions for providing a collective supply of drinking water in rural areas and suburban environments. They also help to eliminate the risks of people, and children in particular, falling into open wells. They also improve the conditions of hygiene under which water is drawn off, by eliminating the use of buckets of uncertain cleanliness, thereby limiting diseases associated with contaminated water. The main disadvantage is the required maintenance, the significant physical exertion required for pumping and the potential difficulty of being supplied with spare parts which may not be easy to obtain. A pump requires regular maintenance which must be carried out if the pump is to be used on a sustainable basis. This maintenance may be provided for several models, which should be preferred by local populations. If not, maintenance and repair may have a relatively high cost that people should be fully aware of at the time the choice is made. In addition, the spare parts that may be required are rarely manufactured in developing countries, especially in the case of metal or cast iron parts. This is the main advantage of PVC pumps the parts of which are less expensive and can often be made on site. One of the main causes of a pump’s deterioration, aside from its frequent use, is the quality of the pumped water. Corrosive water can cause premature ageing of parts. The water then takes on a bitter taste and affects the colour of food cooked in it and clothing washed in it. The materials that withstand corrosion best are : plastic, stainless steel, wood, glass fibre. Another factor wear is sand or other abrasives in the pumped water. The operating and maintenance principles of these pumps specified in the previous fact sheet E 35 "Water hand pumps" which it is recommended that you refer to first if you have not already done so, have probably already convinced you of this. Indeed, it is essential to know how to choose the pump model best suited, both technically and financially as well as in terms of ease and cost of maintenance. There are unfortunately countless examples of pumps, or even wells and boreholes, being abandoned as a result of a poor choice, incorrect use, lack of maintenance or the inability to obtain spare parts or the services of a qualified repair technician. The choice of a pump depends not only on technical criteria and its price, but also on the economic environment (possibility of easily finding spare parts and people able to maintain or repair it) but also on the social environment (public acceptance of the pumping system) and, last but not least, its ease and cost of maintenance. - the price range acceptable to the community. Indeed, the price of hand pumps varies, depending on the way they are manufactured, their use and their resilience, from fifty euros for shallow depths to €2,200 for the most expensive, the most powerful and the most resilient ones, with most mid-range but reliable pumps costing between 500 and 800 euros. Their price also most often varies according to the depth of the well or borehole and the country. It is advisable, at the same time, to look at which types of pumps are most widely used, reliable and long lasting in the region concerned as well as how satisfied their users are with them, as it is better to buy a pump model that has already been successfully used for several years than a new model even if a bit cheaper but which has yet to prove itself and which does not have any real after-sales service in terms of spare parts and maintenance relatively nearby. Having provided the pump seller with all the related data and requirements and asked for a proposal, it is advisable to also ask, if you have not already done so, for the pump’s total delivery head and flow rate. These data are generally presented in the form of graphs (or charts), and most often the graph of the flow rate versus the pump’s installation depth. This may, for example, avoid you choosing a pump that is either too powerful or not powerful enough given the depth of the well or borehole. Note that the greater the delivery head, the smaller the pump cylinder must be, in particular to make the hydraulic force on the piston compatible with the average permissible force exerted. One survey indicated that most of the pumps used in rural Africa descended to a depth of forty metres and had an average flow rate of around 1 m3/h. An important factor in choosing a pump will obviously be its price (purchase and installation). There would be no point in buying an expensive pump for a shallow, inexpensive well. It is advisable, however, not to focus too much on the cheapest pumps. Indeed, it seems much better to pay slightly more for a pump that is likely to last longer and be easier to repair and maintain in serviceable condition, together with efficient after-sales service and maintenance. A pump’s service life and actual cost are largely based on these factors. Experience shows that it is often more difficult to implement an effective, sustainable, low cost maintenance programme than it is to install a pump. UNICEF has, moreover, created a label (VLOM, see previous fact sheet) which it assigns to the pumps it recommends as being locally made and above all able to be easily maintained, and even repaired, in most cases, by village communities. - Pump manufactured or preferably assembled in the country concerned and/or for which it is easy to obtain spare parts and, in the event of a serious fault, find a qualified repair person nearby. Once the choice of the pump has been made in liaison with the pump or water point management committee, which should be set up quickly if not yet done, steps should be taken to make sure that the pump is properly maintained and training given to those able to check it or at least carry out minor repairs. For this purpose, reference should first be made to manufacturers’ instructions and their maintenance manuals which should be requested. In particular, and this obviously depends on the pump model involved, steps should be taken to regularly check the tightness of bolts, grease moving parts and, to prevent premature wear of the existing shafts on several types of pumps as a result of not being provided with self-lubricating bearings, regularly lubricate moving shafts, periodically replace, on the models concerned, the sealing rings to prevent a decrease in pump flow rate and frictional wear of the cylinder, listen to feedback from users and provide for periodic overhaul. 5) Where can you find more information about maintenance issues ? -Inter Aide : Booklet (in english) relating a common maintenance experience with RWSN in Malawi. - WEDC (Loughborough University, G.B.) : interesting fact sheet, in English, entitled "Maintaining handpumps"